We love this tape. 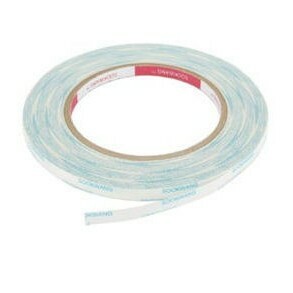 It's double-sided adhesive tape that's incredibly sticky, heat resistant and acid free. Use with embossing powder, foil, beads, glitter, ribbon etc. Great for attaching card layers, box making and scrapbook pages. One neat feature of Scor-Tape is that it's paper backed which means you can tear it with your thumb & finger. No need for scissors! 27 yards per roll. 1/4 inch wide.